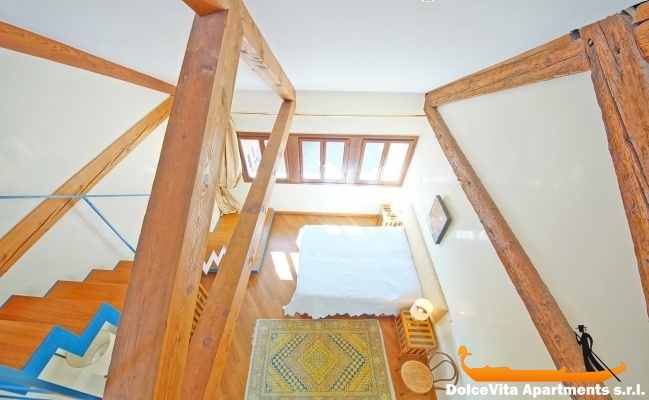 Apartment N. 20: It can accommodate up to 6 people, it is rented from 238 € per Night (not per person). 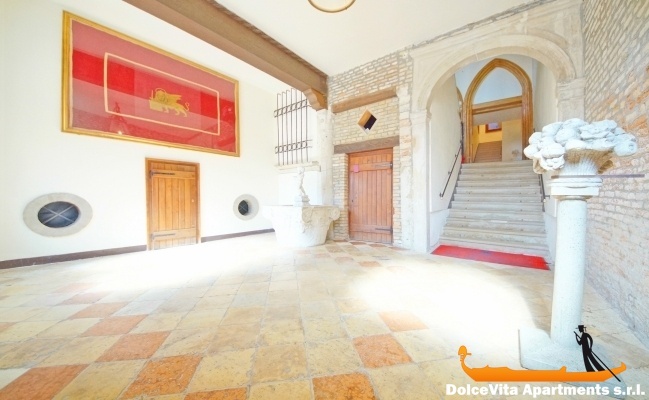 This penthouse in Venice is spacious and bright and it is in a gothic building of great value; the top floor location offers a wonderful view on the island of Saint George and on the entire basin of Saint Mark. 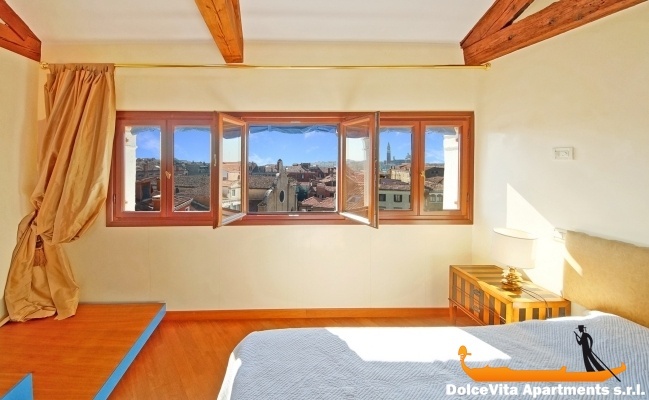 There is also a typical roof-terrace that will allow you to further enjoy the scenery and the charm of Venice. The recent and accurate renovation makes the apartment very comfortable to sleep from 4 to 6 people. 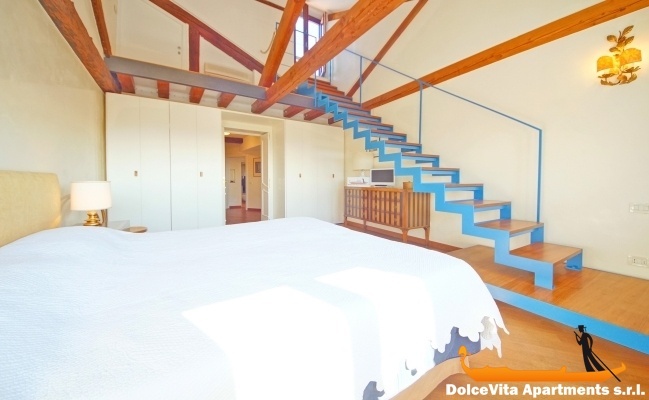 There are two double rooms, each with a bathroom, a very spacious living room with exposed beams (sofa bed for 2 people, digital TV and stereo) and a full kitchen with all appliances. Internet connection is active and in all the rooms there is air conditioned. 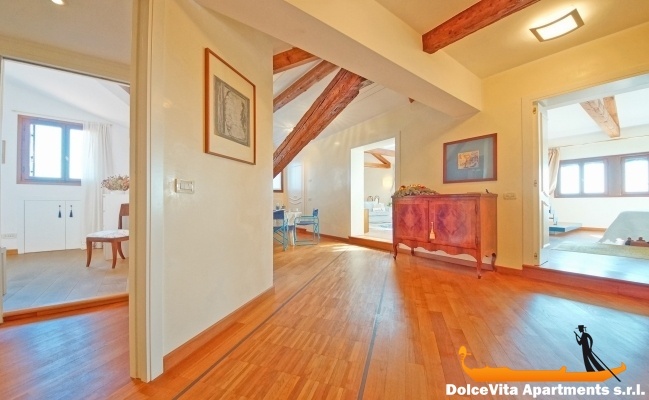 The penthouse is only few minutes walking from the magnificent Saint Mark square. 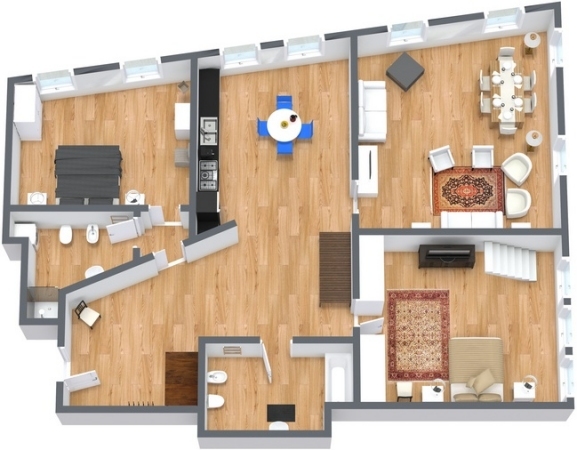 The apartment looked very good on the website but the quality of it surpassed our expectations. 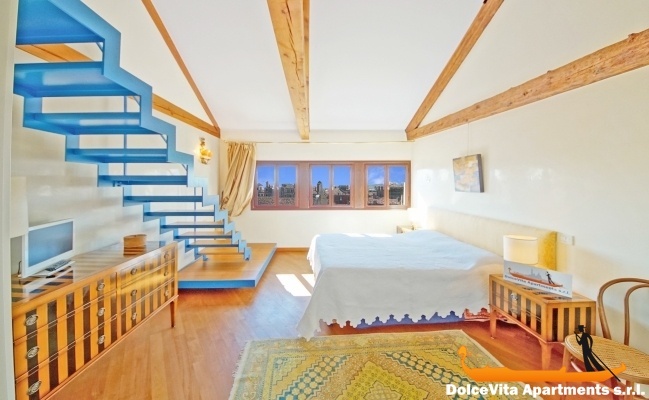 A fantastic location in a peaceful campo but close to local shops and restaurants. Only a short walk from the vaparetto and St Marks basilica.The view from the rooftop terrace was stunning especially as the sun was setting behind the cupolas. You can't expect a rooftop terrace without climbing to the roof,the 98 steps up to the apartment each time and a few more to the terrace was worth the effort. I particularly enjoyed throwing open the bedroom windows each morning to listen the the many different bells ringing. When we return to Venice we would like to stay here again. The service right from our first contact was prompt, friendly efficient and thorough. Everything went very smoothly and your representative Orsola was waiting to greet us as we arrived even though we were an hour later than expected. A first class service. We absolutely loved it. It was everything I hoped for from the images. Light, airy, clean, spacious and of course with the wonderful altana. It was even a pleasure climbing all those flights of steps for the view at the top. The apartment was magnificent 5 out of 5 for us. It is a good walk up the stairs but the view from the balcony is worth the walk. The location is ideal and we will definitely look to return. Thanks for all the help prior to arrival and the patience in waiting for us as we were a little late. Perfect welcome by Orsola , availability, smile .... beautiful apartment, great class, spacious, tasteful decoration, very well equipped, very well located, perfectly calm, terrace with splendid view ...... really very well! I have no words to describe this apartment, excellent in every respect. 5 points Evidently a very nice apartment, with all the comforts for a pleasant stay and above all very, very well located; small supermarket just next door, and next to place to have breakfast and a good restaurant; very close to the vaporettos, too. We'll be back. We had a great time in the apartment and on the terrace, with the magnificant view. You can tell the owner has given a lot of thought when furnishing about what a person wants and needs when he stays in the apartment, in other words it’s very nice and complete. In one word: amazing! 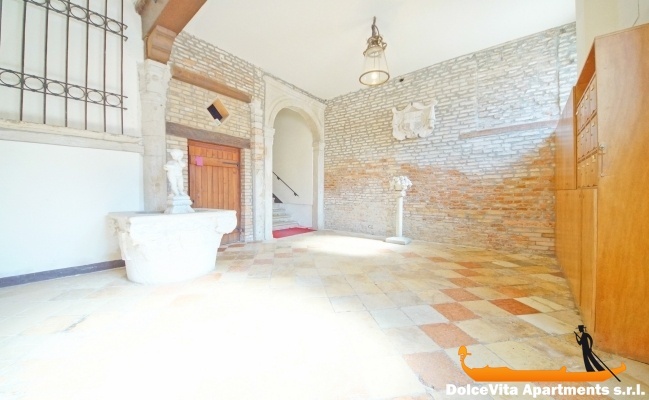 The stay in Venice, already beautiful in itself , it was even more enjoyable for the quality of the accomodation . The apartment is bright, spacious and well furnished, equipped with all the comforts and amenities that make you feel at home. The photos on the site correspond perfectly to reality, but the atmosphere is even more beautiful than what we expected . Despite the weather was not great we were able to appreciate the breathtaking view from high seat at various times of the day. The apartment is wonderful - good location, great views, spacious, comfortable, extremely well equipped for a long stay ( ours was two weeks) and with good privacy for two couples . It is also very well served by local food shops so everything is very convenient. Splendid neighborhood and view. Apartment well kept, well equipped. Perfect service. High quality apartment, very well equipped. Great location, but in a fairly quiet area => lots of charm. 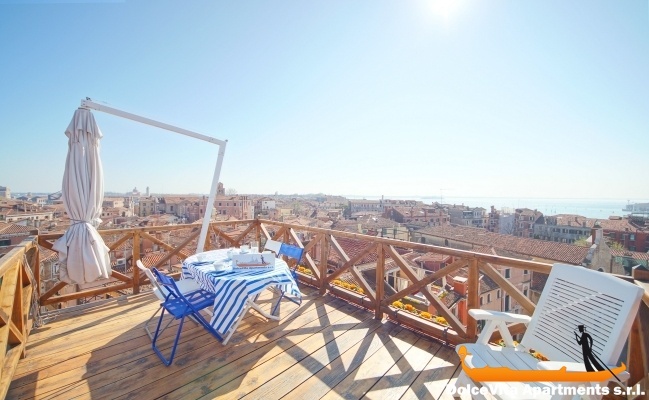 The terrace is a real beauty, with an incredible view of Venice. We stayed the second time at this wonderful apartment and all 4 we loved it again to stay there!!! The view is marvelous, the flat is beautiful, the roof-terrasse is absolutly wonderful!!! Your service is perfect, all we booked is top and all persons we had to do with were really nice, thanks a lot! We will stay in ap. No. 20 again and come back to venice. We had a brilliant time – the apartment was fantastic – it really is better than your photographs – we had wonderful times on the roof. I was worried about the beam in the kitchen – but it was nothing. 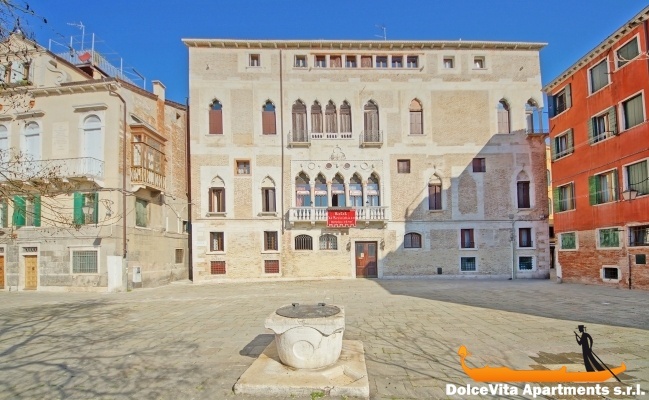 The area is really good – in the Castello – close to authentic Venice – but easy for San Marco too. There are lots of good restaurants and lovely food shops. 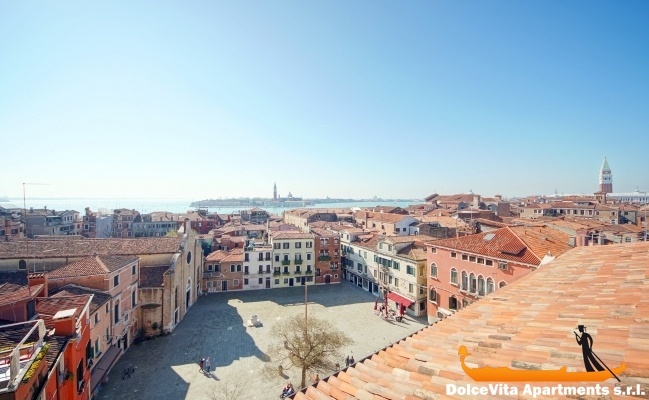 We have been to Venice many times – but this is the best spot we have found – we will definitely come back. The apartment is just amazing, especially the roof terrace is incredible. The kitchen and bathrooms are equipped with all necessary things and the interior design of the apartment is just luxurious. Very spacious, tastefully furnished, functional, and with the little details that make you feel at home. 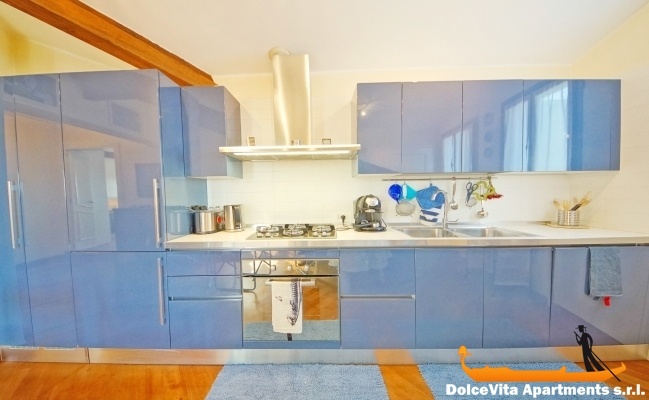 Wonderful location just 5 minutes from Piazza San Marco, but in a quiet area with shops, supermarkets and restaurants in walking distance, 100 meters from the vaporetto stop Arsenal. The owners welcomed us with great kindness and if we return to Venice we will book this apartment again without hesitation. The apartment is very central. Fantastic location, has a breathtaking view. My opinion about the apartment: large and very comfortable, you can enjoy a lot your stay. Its location is perfect and away from tourist flow. 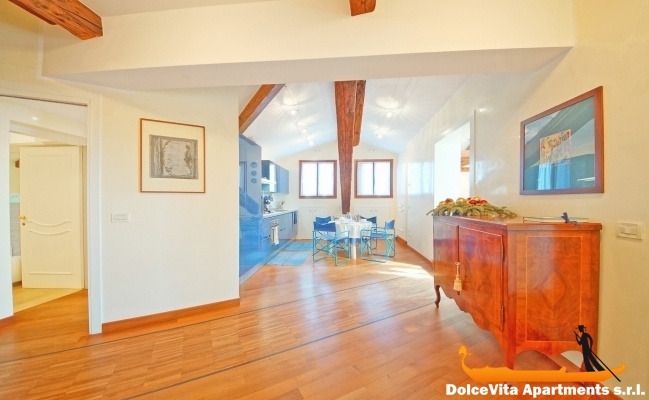 The apartment is beautiful, renovated and decorated with taste. It is large, very comfortable and soundproof inside and outside. This is an absolute must! If we return to Venice (we hope!) we will rent again this fantastic penthouse. Great customer service, we appreciate the the ability to understand our needs and the promptitude of Eugenia. It was a pleasure corresponded with her and thank you for all the good advice! Serena and Orsola were attentive hostess. This is a premium service. The apartment is great and the views are stunning, and is perfectly situated in a quiet location but very close to all the main places. 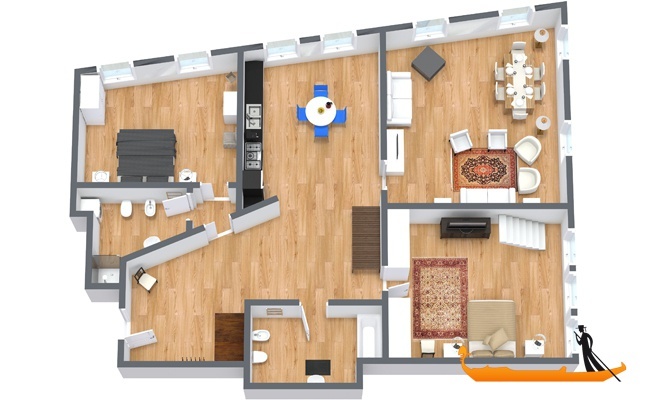 I can say that in your web site everything is explained well, on other websites pictures do not correspond to reality, but in your case, the apartment is even more beautiful than in the photos. The welcome we received on arrival by Serena was excellent. We were delighted with the apartment and will be recommending it to all our friends. We loved everything about the apartment- its view of the piazza below, the layout of the rooms for comfort and privacy, the efficient and well-equipped kitchen and the magical roof-deck. It was a wonderful departure point for the vaporetto and the right distance from tourist sites such as st. Mark's. The apartment also has a wonderful atmosphere and lovely furnishings, a perfect combination of historic charm and luxurious upgrades. We stayed in many places during our travels and this was overwhelmingly our favourite. 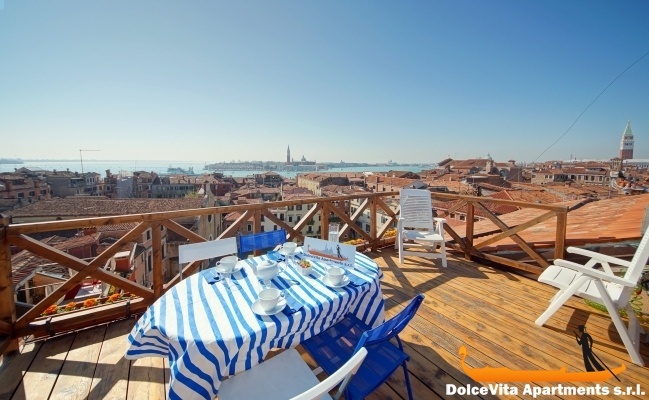 We hope to come back someday and spend many more hours looking at Venice from the deck.